If you haven’t heard or seen by now then you’ve clearly not been playing enough Destiny 2. Dead Orbit won the Faction Rallies event, meaning more Guardians allied themselves with the space goths who want to spread the Traveller’s influence as far as possible, no star is the limit. This means that Arach Jalaal is incredibly happy, if you go and chat to him he’ll give you a pep talk and everything. 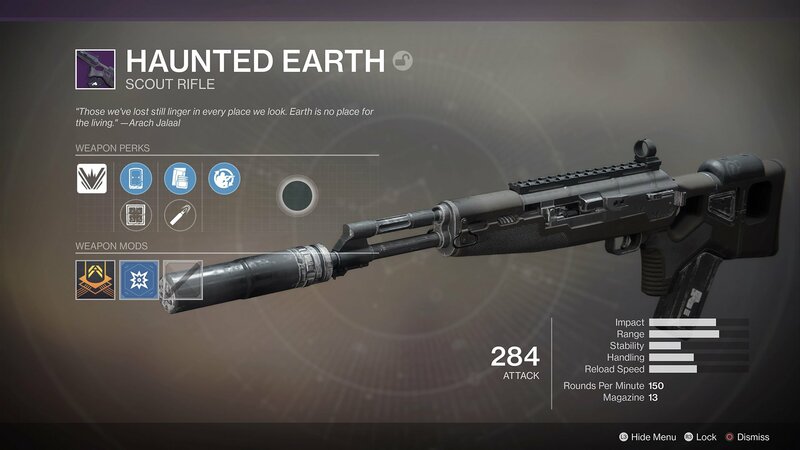 It also means that now players can get their hands on the Dead Orbit exclusive Scout Rifle for only 10,000 Glimmer, if they supported Dead Orbit that is. For anyone else the weapon will cost 50,000 Glimmer, which is a huge number of hours as most of you will know. This Dead Orbit Scout Rifle wallpaper is the weapon you can now buy, but is it worth worth 50,000 Glimmer, or even 10,000? Having used the weapon personally I can confirm that it’s not the best, but it’s a very good Scout Rifle. That might sound contradictory but when it comes to shooting aliens in Destiny 2 it really does make a lot of sense. Scout Rifles are meant to be used at a distance, a great distance. This allows you to take careful aim and hit the target in the sweet spot. Even in the Crucible, where enemies are just as fast and unpredictable as you, a Scout Rifle can make all the difference when it comes to the final shots that bring them down. The aim is good and the rate of fire steady enough to help you blast down anything before you. However, this Scout Rifle also isn’t the best for certain types of players. I love a high rate of fire in my weapons, and using this really does feel like you’ve got some level of drag on the bullets or something that’s slowing you down. Every time I’ve died in the game using this weapon it feels like the weapon let me down, not my own skills. The thing is I do need a weapon like this occasionally, but not while I’m frantically trying to take down wave after wave of enemies. Dead Orbit has proven the popular choice this time around, but will another faction rise the next time Faction Rallies occurs? I’m interested to see if the even occurs more frequently, and if you can earn rewards with them throughout the week instead of only when the event is live. Only time will tell.